Once upon a time, the manufacturing service chain was comparatively black and white: manufacturers would make things for people, and service companies would do things for people. Not any more. Today, boundaries are blurring, as trailblazing manufacturers embark on a transformation known as ‘servitization’. Servitization has been a long time coming. In fact, as Dr. Lightfoot argues in his book, Made to Serve, academics have been encouraging manufacturers to focus on the customer end of the supply chain for over two decades. If companies have been slow on the uptake, it could be because the move from making products to delivering product-centric services is no small shift – it means transforming both your organisational structure and processes. Customer Intimacy. Combining detailed customer knowledge with operational flexibility, to create the best total solution for the customer. Operational Excellence. Controlling processes to effectively deliver best total cost to the customer. Product Leadership. Selling the best product on the market. What makes for a successful servitization strategy? One thing that all the servitization pioneers Dr. Lightfoot studied had in common was their use of connected technology to inform and improve use, maintenance and repair actions. Monitor. Transducers, data storage and fault code generation are used to continuously sense critical product systems and subsystems. Transmit. Base and fault code data is periodically transmitted by the product either via satellite, GRPS, radio, internet or cell phone. Store. The data is stored by the organisation on either hard or soft storage systems. Analyse. The data is diagnosed and analysed to predict future product behaviour and usage trends. Respond. The company determines appropriate interventions such as offering a repair/replacement, contacting the customer, modifying product design or drafting a contingency plan. It’s not just high value capital equipment (such as Rolls-Royce’ TotalCare for civil aerospace) that’s driving servitization. 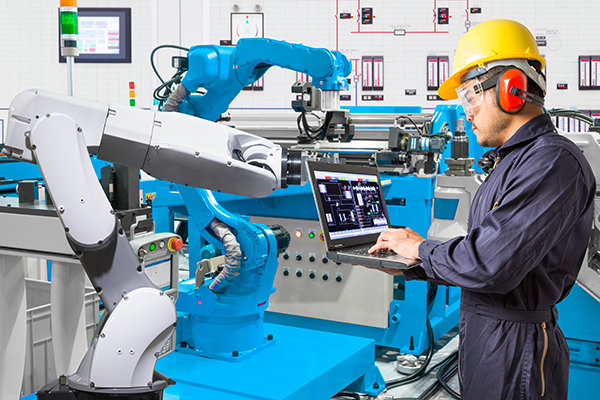 The ‘Internet of Things’ (IoT), while still in the early stages of adoption, is turning the physical world into a digital information centre - one of the cornerstones of Industry 4.0. Think sat-navs, speed cameras, pace-makers, helmets and even toasters – these ‘smart’ connected objects collect huge volumes of data for their manufacturers, and can amend their service dependent on the behaviour of the world around them. At Salesforce, we’re helping companies in every industry become more customer-centric, and differentiate on service – from triggering service actions through Machine2Machine connectivity, to enhancing customer experiences with AI, all from a single connected platform. To help you blaze your own path, we surveyed nearly 300 manufacturing customer service professionals to understand the trends shaping the future of the industry. 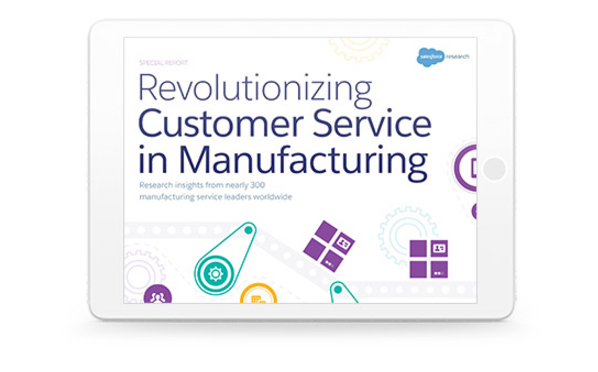 Disscover the habits of top manufacturing customer service teams, download the full report.